Massive Audience – Facebook is the 2nd largest trafficked website, with over 500 million active users. Whoa! That’s huge. Mobile – 150 million active users take Facebook with them everywhere they go. It is expecting to increase yearly. Format – Many video formats are supported for uploading. See the entire list here. Tagging Capability – You can tag friends in a video. It also appears on their timeline and on their friends’ news feeds. Conversions – When done creatively, call-to-action may lead to conversion. Cool! You might want to ask why Facebook, why not use YouTube. I agree, YouTube video platform is more robust than Facebook but don’t ignore how much Facebook users spend their time online. 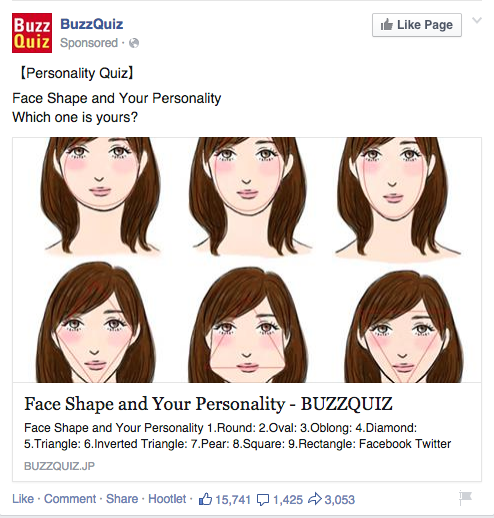 So, if you think your target audience is spending so much time on Facebook, take advantage of that. It’s an incredible opportunity for business to get in front of millions of Facebook users either on desktop or mobile. Create or upload a video on your Facebook page. Promote it organically or paid. 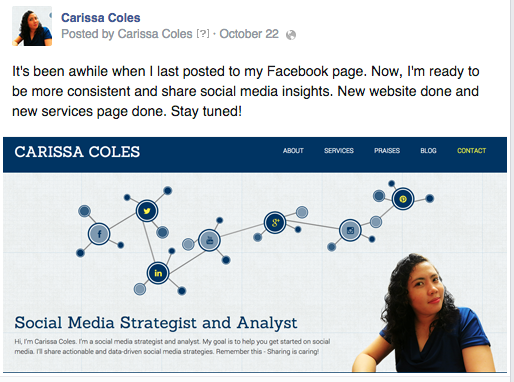 If you want Facebook engagement for your videos, add them directly to your Facebook Page. Video commercials – reinforce your marketing efforts online by sharing commercials for your business directly on your Facebook Page to increase engagement and feedback. Ask fans to share their feedback about your product. The good thing about this is you don’t need to create video content. Your fans can do it for you. Schedule a fan appreciation day. Since you can record a video directly from your webcam, why not send personal messages to your fan. Marketingland wrote an article about sharing links on Facebook. By simply pasting in a URL, Facebook will automatically make a post and grab the title, photo, and description from the page being shared. Another example is just adding a text with the photo without adding a link. See the photo below. No matter what post format you choose, it depends on your target market. Do an experiment. Make two photo posts: one with text only and one with link and text. See which get more like and engagements. Who doesn’t love selfies? Maybe I don’t do selfie most of the time. But what you don’t know most people and brands use selfies for social media marketing. Yes, you heard it right. No matter what you think of selfies, they’re one of the best and will not go away.Get creative. If you own a store, let your buyers take a selfie in your store and tag your Facebook page and even ask them to include your hashtag. Check out postplanner’s selfie ideas and try to apply one of them. Make sure your audience can relate to you and doesn’t sound too salesy or narcissistic. Use them to empower your audience and spread positive vibes. Try your first selfie today and let’s see what will happen. How much do you often see these kind of posts? I don’t have problem seeing ads on my newsfeed. Actually, I do observe them and assess every part of the ad. I believe that Facebook is now a pay-to-play platform. And if you want to take a massive chunk of your target audience’s attention, advertising on newsfeed is a must-do. It has a great advantage on mobile too. Start advertising on Facebook. 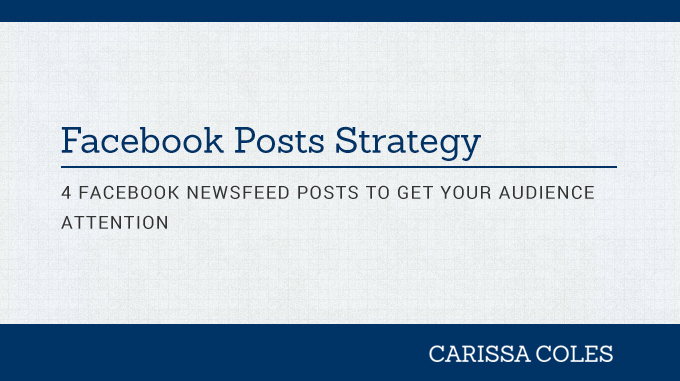 If your goal is to increase page likes, choose that objective. Run the campaign and see what will happen. 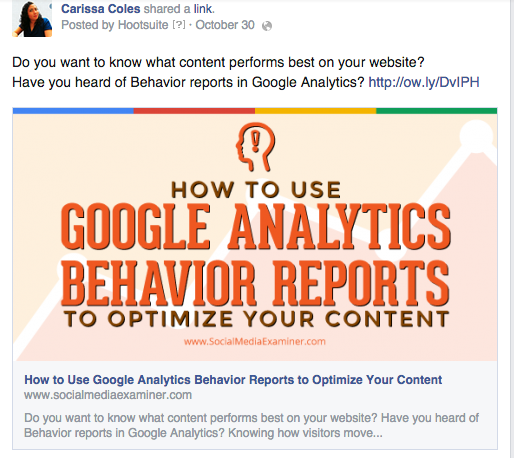 After reading this, what kind of post you want to try and monitor the performance? Share and comment below. That’s social media!